Check out the 2017 FAA Annual Report! 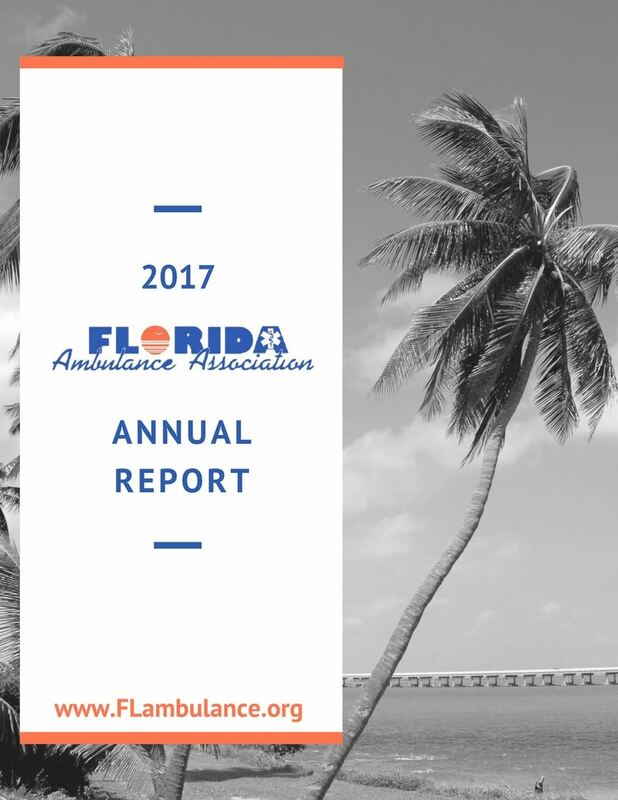 The Florida Ambulance Association is hard at work for its members. The board represents the interests of ambulance providers on an array of legislative and regulatory fronts. Read all about YOUR association's 2017 activities in the Annual Report newly posted to the member-only section of the FAA site. This MLN Matters Article is intended for providers and suppliers billing Medicare Administrative Contractors (MACs) for ambulance transport services provided to Medicare beneficiaries. Change Request (CR) 10549 provides instructions regarding Section 53108 of the Bipartisan Budget Act of 2018. This section reduces the ambulance payment by 23 percent for non-emergency Basic Life Support (BLS) transports of individuals with End-Stage Renal Disease (ESRD), to and from renal dialysis treatment (at both hospital-based and freestanding renal dialysis treatment facilities). Please make sure your billing staffs are aware of these changes. Payment for ambulance transports (including items and services furnished in association with such transports) are based on the Ambulance Fee Schedule (AFS) and include a base rate payment plus a separate payment for mileage. This raised payment reduction for non-emergency BLS transports to and from renal dialysis treatment applies to both the base rate and the mileage reimbursement. CR8269, issued May 10, 2013, implemented Section 637 of the American Taxpayer Relief Act of 2012, which, for transports occurring on and after October 1, 2013; required a 10-percent reduction in fee schedule payments for non-emergency (BLS transports of beneficiaries with ESRD); to and from both hospital-based and freestanding renal dialysis treatment facilities, for non-emergent dialysis services. The MLN Matters article associated with this CR is available at https://www.cms.gov/Outreach-and-Education/Medicare-Learning-Network-MLN/MLNMattersArticles/Downloads/MM8269.pdf. CR10549 provides instructions regarding Section 53108 of the Bipartisan Budget Act of 2018, (signed into law on February 9, 2018), which requires that, effective October 1, 2018, the reduction of fee schedule payments for BLS transports to and from renal dialysis treatments be increased to 23 percent. Non-emergency BLS ground transports are identified by Healthcare Common Procedure Coding System (HCPCS) code A0428 (Ambulance service, basic life support, non-emergency transport, (bls)). Ambulance transports to and from renal dialysis treatment are further identified by origin/destination modifier codes “G” (hospital-based ESRD) and “J” (freestanding ESRD facility), in either the origin or destination position of an ambulance modifier.  Effective for claims with dates of service on and after October 1, 2018, payment for non-emergency BLS transports to and from renal dialysis treatment facilities will be reduced by 23 percent. The reduced rate will be calculated after the normal payment rate (including any applicable add-on payments) is calculated, and will be applied to the base rate for non-emergency BLS transports (identified by HCPCS code A0428 when billed with the indicated modifier codes) and the associated, separate mileage payment (identified by HCPCS code A0425). Payment for emergency transports and non-emergency BLS transports to other destinations (rural and urban) will remain unchanged. The AFS will also remain unchanged. For ambulance services, suppliers and hospital-based ambulance providers must report an accurate origin and destination modifier for each ambulance trip provided. Origin and destination modifiers used for ambulance services are created by combining two alpha characters. Each alpha character, with the exception of “X”, represents an origin code or a destination code. The pair of alpha codes creates a modifier. The first position alpha code equals origin; the second position alpha code equals destination. The reduction will be applied on claim lines containing HCPCS code A0428 with modifier code “G” or “J”, in either the first position (origin code) or second position (destination code) within the two-digit ambulance modifier code and HCPCS code A0425. Note: This 23-percent reduction applies to beneficiaries with ESRD that are receiving a non-emergency BLS transport to and from renal dialysis treatment. While it is possible that a beneficiary who is not diagnosed with ESRD will require routine transport to and from renal dialysis treatment, it is highly unlikely. However, MACs have the discretion to override or reverse the reduction on appeal if they deem it appropriate based on supporting documentation. The official instruction, CR10549, issued to your MAC regarding this change is available at https://www.cms.gov/Regulations-and-Guidance/Guidance/Transmittals/2018Downloads/R4017CP.pdf. If you have any questions, please contact your MAC at their toll-free number. That number is available at https://www.cms.gov/Research-Statistics-Data-and-Systems/Monitoring-Programs/Medicare-FFS-Compliance-Programs/Review-Contractor-Directory-Interactive-Map/. Disclaimer: This article was prepared as a service to the public and is not intended to grant rights or impose obligations. This article may contain references or links to statutes, regulations, or other policy materials. The information provided is only intended to be a general summary. It is not intended to take the place of either the written law or regulations. We encourage readers to review the specific statutes, regulations and other interpretive materials for a full and accurate statement of their contents. CPT only copyright 2017 American Medical Association. All rights reserved. The American Hospital Association (the “AHA”) has not reviewed, and is not responsible for, the completeness or accuracy of any information contained in this material, nor was the AHA or any of its affiliates, involved in the preparation of this material, or the analysis of information provided in the material. The views and/or positions presented in the material do not necessarily represent the views of the AHA. CMS and its products and services are not endorsed by the AHA or any of its affiliates. After the renewal of the ambulance Medicare add-ons, the Centers for Medicare and Medicaid Services (CMS) made a mistake when it uploaded the 2018 SNF Consolidated Billing file. CMS neglected to list the ambulance HCPCS codes (A0425, A0426, etc.) as exempt. As several members have noted, this resulted in many erroneous claims denials for patients in SNFs. After consultation with experts, FAA believes that this issue has been resolved, and that no action is needed by ambulance providers. FirstCoast is expected to automatically reprocess the erroneous denials fairly quickly. Read the most recent FirstCoast post about this issue. For over 25 years, the Florida Department of Health had the honor of recognizing the men and women who provide lifesaving services in times of crisis. This is a small way of paying tribute to the brave medical professionals and agencies that ensure the public’s health and safety in times of an emergency. The following award categories represent several aspects of the prehospital environment. The department is honored to receive nominations each year. The Application form is now available. 5 year extension of the ambulance Medicare add-ons through December 31, 2022, retroactive to January 1, 2018. AAA’s preferred method of Cost data collection that provides flexibility to the Secretary of HHS in developing the system. Consultation with the industry is required so that it strikes the appropriate balance between obtaining meaningful data while not overly burdening or onerously penalizing the ambulance services. The penalty for failing to report required data would be a reduction in payment up to 10% for the year following the year in which the data should have been submitted. AAA objected to the house proposed penalty of up to a year of Medicare payments clawback or withholding of payments. A clause is included to wave the penalty in cases of hardship. A “pay-for” for the 5-year extension of the add-ons with a 13% cut to non-emergent dialysis transports – the AAA had objected to the offset and pushed for a cut targeted to just those entities which abuse the dialysis transport benefit. AAA was successful in reducing the initial cut from 22% to 13%. The AAA is actively working on other pay-for options that would replace the 13% cut with something targeting dialysis fraud and abuse. Additionally, thanks to eagle-eyed FAA member Bryan Andrews for the following information! At yesterday's FAA membership meeting, long-term former board member Chief Dave Dyal received the FAA Lifetime Achievement Award. Congratulations, Chief Dyal, on your retirement! 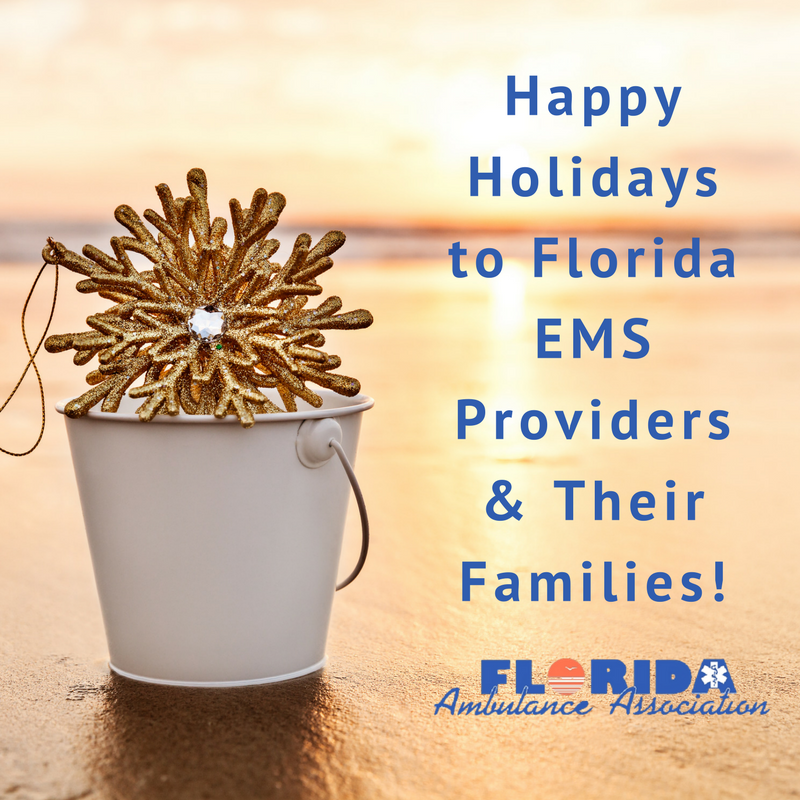 The Florida Ambulance Association wishes EMS across our state a safe and happy holiday season. Thank you for your service! It is with personal regret but deepest warm wishes that I announce the retirement of Florida Ambulance Association President Walt Eismann. Walt served the FAA for decades, and EMS since 1982. We thank him for his guidance, time, and thought over these many years. It is a testament to Walt’s excellent governance and leadership that our association can continue to move forward, even in his absence. In accordance with FAA bylaws, as your Vice President I have assumed the role of Interim President until our meeting in Daytona Beach in January. At that time, the membership will discuss this matter further and determine whether to hold a special election that day or wait for the regularly-scheduled elections in July. In the meantime, the FAA board—Immediate Past President Alan Skavroneck, Secretary Terence Ramotar, Treasurer Holly Martin, and myself—continue to work diligently to continue seamless representation of our industry in Tallahassee. Should you have any questions, please don’t hesitate to contact faa@ambulance.org, or reach out to me directly at jpeterson@sunstarems.com. Thank you for your continued support of the Florida Ambulance Association.